4 Is Gaining Weight Really That Simple? The question is legitimate and one that frustrates those who find themselves on the light end of the scale. While those on the heavy end can’t get through a commercial break or flip through the pages of a magazine without being offered a solution to their weight problems, it can be a lonely struggle for those who want to put on weight. If you are lucky enough to get a reasoned response to your question, it will probably involve the words “eat more.” That, despite being obvious, is great advice. Quite simply, to gain weight you will need to up your calorie consumption to the point where you consume more calories than you expend. Couple an increased caloric intake with a little weight training and you have the recipe for healthy weight gain. You may think you eat a lot, even enough to keep pace with your more weight-furnished friends, but you are probably over-estimating your intake. After a trip to the doctor’s office to rule out medical causes for your inability to bulk up (thyroid disease and other medical problems can hamper weight gain), a first step to designing an effective weight gain program is to journal your eating habits. Counting calories for a week will give you an accurate view of your diet. From there, increase your daily caloric intake by about 300-500 calories until you start putting on the pounds. Keep in mind though, while your caloric intake will directly influence your bodyweight, it will be other factors like the types of food you eat and your weight training regimen that decide the type of weight you are putting on. So if you are after an aesthetically pleasing weight gain, that of lean muscle weight as opposed to just some extra body fat to lug around, it will be important to pay attention to these factors. Providing your body with the materials it needs to build muscle is only one piece of the puzzle. A weight training program designed to give the body a reason to add some muscle will be very important to achieving your goals. Your workout routines should concentrate on compound weight lifting exercises (those that involve multiple muscle groups like the squat or bench press) with weights that allow you to do 6 to 12 reps per set. Higher rep ranges will tone your muscles but may not sufficiently signal the body into muscle growth. Try to either increase the amount of weight lifted or the reps completed with each workout. Don’t go overboard with your workouts. Two or three one-hour workouts per week done with intensity should do the trick. Too often those that have trouble gaining weight (hardgainers) spend too much time in the gym. This can be counterproductive in two ways. First, it means you are burning off a lot of the calories that could otherwise be used to build muscle and, second, you can over-train your muscles by working them too hard, basically making them unresponsive. If you are looking for some company in your quest to gain weight, venture into the bodybuilding community. There you will find many people also seeking ways to put on lean muscle mass. You will also find many products marketed to help you gain weight. Be very cautious when looking at these products. Gaining weight may not be as in demand as losing weight but it is still big business and there are a lot of companies out there looking to take your money. While some of these products can help, others aren’t necessary. Is Gaining Weight Really That Simple? Well, yes. It is only when you start confusing the process by focusing on convenient excuses (metabolism, time, etc.) that it starts to get complicated. If you want big progress, keep it simple. Check this page for the Big 4 Factors… Weight Gain Plan: Factors For Success (Pt. 1). Learn how to design and execute a complete program, from setting your start date to getting rolling, that will pack on the muscle. 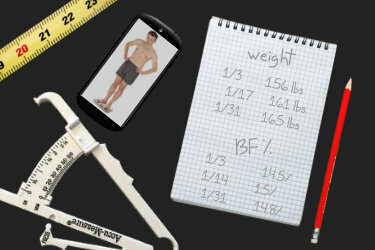 An overview of how to track and the things you need to track – from body composition to your diet and training journals.